There are a number of skirting board designs that are considered standard due to their consistent popularity and widespread use within the construction industry. Although these designs are widely available, each supplier tends to have subtle variations in their design. For that reason, if you are trying to match an existing skirting board design it is well worth checking with our sales team that the profile you are thinking of ordering will be suitable. Although widely available, there is a great variance in overall quality depending on the supplier. 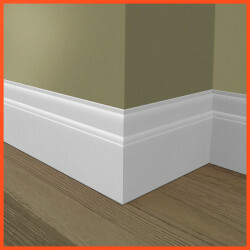 We operate at the very top end of the spectrum in terms of quality, with all of our standard skirting boards being manufactured from industrial grade, moisture-resistant MDF. We recommend ordering a free skirting board sample to see how our products compare with some other mass-produced alternatives found in larger DIY retailers and timber merchants. Perhaps the most popular design in the standard category is the Torus skirting board. We have a couple of variations of this classic design available in a range of heights and thicknesses. Other popular tandardskirting board designs include the Bullnose, Mini Bullnose and Ogee. In terms of sizes, standard skirting boards tend to be ordered at 120mm high and 18mm thick, although we do offer a full range of options so that you can get the most appropriate size for your project.